While the federal government has shifted gears, Southern California continues to demonstrate the political influence of Latinas and Latinos as Los Angeles County supervisors, as well as in city council seats and races for State Assembly and Senate. 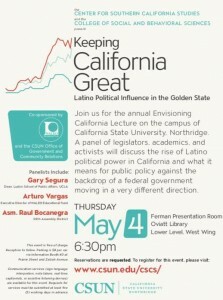 California State University, Northridge’s Center for Southern California Studies (CSCS) and College of Social and Behavioral Sciences will host its annual Envisioning California Lecture with a panel discussion on “Keeping California Great,” addressing the rise of Latina and Latino political power in California, at 6:30 p.m. on Thursday, May 4. The event will take place in the Delmar T. Oviatt Library’s Jack and Florence Ferman Presentation Room, in the library’s west wing. The campus is located at 18111 Nordhoff St. in Northridge. The panelists for the event will be Gary Segura, UCLA’s dean of the Luskin School of Public Affairs; Arturo Vargas, executive director of the National Association of Latino Elected Officials Educational Fund (NALEO), and Assemblyman Raul Bocanegra. CSUN political science professor Lawrence Becker, director of the CSCS, and the panelists will engage students and the community in the discussion. “When you look at Southern California politics, the big story of the last couple of decades is the rise of Latino political power, the changing demographics and the changing of power in Los Angeles,” said Becker. Every year, the Envisioning California Lecture tackles issues of public policy and spurs dialogue around issues relevant to California. This year’s topic grew out of a 2016 project, “The History, Development, and Policy Influence of the California Latino Legislative Caucus,” organized by Becker and other CSUN faculty members. “If you want to understand LA politics, politics of the region and the public policies that are enacted, you have to understand what’s happening with Latino political elites and political Latino grass roots,” said Becker. In the 2016 national election, the Republican Party won control of the presidency and both houses of Congress, while California moved in a different direction. The Center for Information & Research on Civic Learning and Engagement (CIRCLE), an organization that collects research on the civic and political engagement of Americans between the ages of 15 and 25 noted that 24 million millennials participated in the 2016 national election. Millennials’ presidential votes shook out at 55 percent for Hillary Clinton and 35 percent for Donald Trump. According to the post-2016 election update of Becker and colleagues’ Latino Legislative Caucus project, Clinton won California by a larger margin than President Obama in 2008 and 2012. When California’s voters gave Democrats in the state legislature larger margins in the Assembly and the State Senate, the CLLC also grew from 22 to 27 members. The discussion at the event will be forward-looking and will assess the implications of the rise of Latino political influence in California against the tide of policies from the federal government. “One of the things that we talked to members of the legislature and former members of the legislature about is how they got their start in politics,” said Becker. “It all came back to their time as college students. “The historical rise of Latino political power in California is really about activism among young people, so this is about political efficacy and what that means going forward,” he said. The event is also co-sponsored by NALEO Educational Fund and the CSUN Office of Government and Community Relations. Parking is $8 on campus, and permits are available at the kiosk at Prairie Street and Zelzah Avenue. Sign language interpreters, note takers, real-time captionists and assistive listening devices are available for the event. Requests for services must be submitted five days in advance. To RSVP for the event, visit the CSCS website.